Former Republican Governor Terry Branstad has donated to a Republican challenging Congressman Steve King’s bid for reelection. Branstad and King had been long-time allies. Two of Branstad’s top 2010 campaign staffers went on to help steer King’s 2012 reelection. Now, Branstad has donated $1000 to Randy Feenstra, the state senator who is running against King in the 2020 primary. King held a town hall meeting in the small community of Stanhope yesterday. King said the controversy that led Republican leaders to remove him from House committees derailed his plan to meet in January with Iowa’s two new House members. 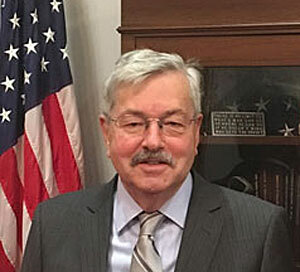 Iowa’s congressional delegation has flood recovery to work on together, King said, and he plans to set up a meeting with Congresswomen Abby Finkenauer and Cindy Axne. During yesterday’s town hall meeting, King was asked about his working relationship with the two new Democrats in Iowa’s congressional delegation. King will hold a town hall meeting in Pocahontas County later this week. The event will be held at the Laurens Public Library on Wednesday afternoon.